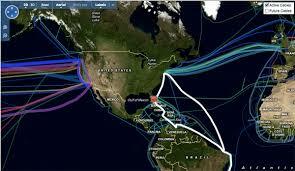 Main purpose of this lecture is to presentation on International Submarine Cable Network. Submarine Cable Network is a cable laid on the sea bed between land-based stations to carry telecommunication signals crosswise stretches of ocean. Earliest submarine communications cables, laid in the 1850s, passed telegraphy traffic. This lecture briefly describe General Features of Submarine Cable and Basic Structure of Submarine Cable. Here also focus on role of Submarine Cable, Procedure of Submarine Cable Construction and Special Equipments for Construction.